Sunseed Desert Technology is a learning centre located in southern Spain, concentrating on solutions for semi-arid agriculture and low-impact living. The centre has a very limited budget to promote its activities and research. It has been increasingly relying on blog posts and social media to draw visitors to its website for ongoing publicity and fundraising drives. One recent fundraising drive aimed to raise money to pay for materials needed to repair the roof of the main house. The centre wanted to increase interest in its campaign by releasing interesting data and facts on a regular basis -- to build an audience and create a groundswell of momentum for the campaign. The specific difficulties the project workers encountered while trying to run this campaign led them to re-evaluate their social media strategy. To make things easier, they started using a tool which allowed for cross-posting. To address these problems, the project chose to use an internet service called IFTTT to manage its social media activities. 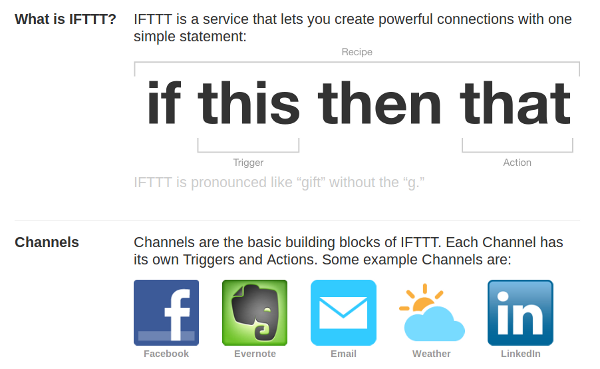 IFTTT.com is an easy-to-use online service which automatically undertakes an action in response to a trigger, as defined by the user -- hence the name IFTTT: 'If This Then That'. 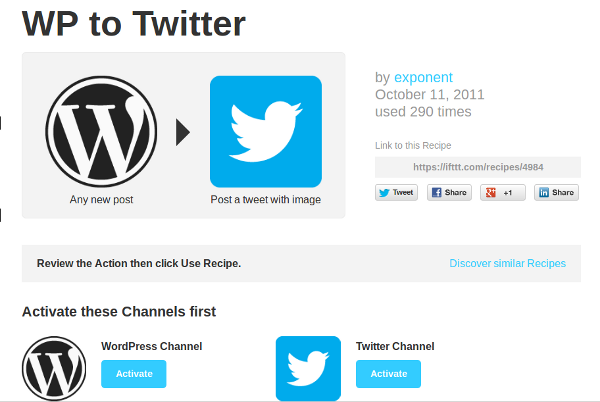 Using IFTTT means that each time a project member posts blog content to the project's website, this content is cross-posted to Twitter and to Facebook. Other social media tricks were also put in place: videos uploaded to Vimeo, and audio uploaded to SoundCloud, are posted to the website, Twitter feed and Facebook page. After setting up an account on IFTTT.com, the project had to create channels for each of its online presences. This involved either inputting user details or setting up OAuth connections. When posts are published, this triggers IFTTT.com to cross-post to other channels. The tool also helped the project to overcome a particular limitation: the use of Facebook at the project was restricted. A blocking rule had been set up on the network router as a way of limiting the bandwidth use of the radio-based internet. 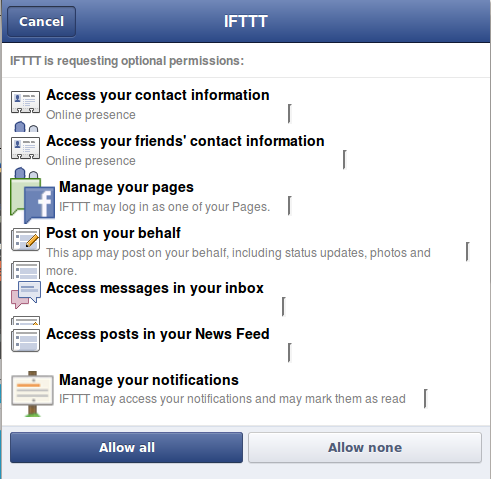 Before using IFTTT, the project block allowed for the limited use of Facebook as an outreach tool by temporarily disabling the block. 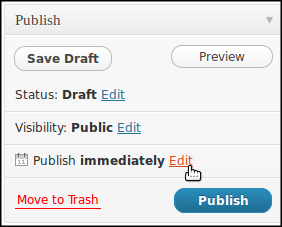 After setting up the initial IFTTT connection, however, all blog posts could be sent to the project’s Facebook page without having to disable this filter. Cross-posting to Facebook also allowed for an additional possibility. Visitors to the centre were encouraged to set up a learning blog on the project website. Once this was created, the blog was then set up to cross-post content to the Facebook page of the visitor, allowing them to share their experiences with their own network of family and friends. In this way, the project’s bandwidth could be used to share knowledge and promote the project to the social networks of visiting volunteers, without the additional bandwidth normally needed for social networking site use. There are other possible uses of IFTTT that could be helpful to a similar project. These include: logging temperatures available online on an online spreadsheet; automatically replying to emails based on their titles; or sending text messages to project members when the subject line contains the word ‘Urgent’. 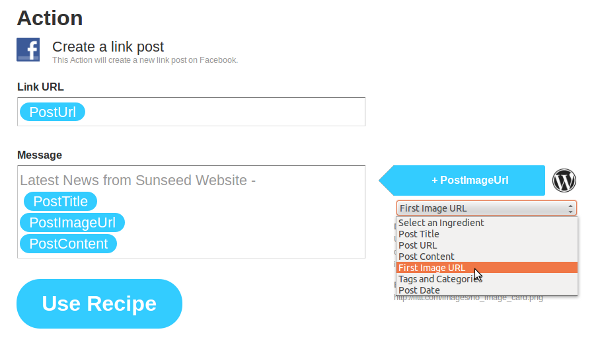 As the Sunseed project has a WordPress-based website, it can take advantage of a recipe that has already been set up by another user of IFTTT. 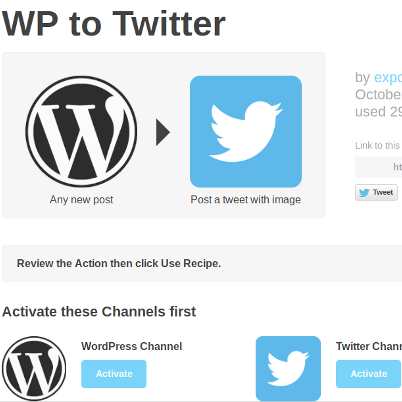 The recipe allows you to automatically post a tweet when a WordPress site is updated. From the image above, you can see that users are prompted to activate specific channels to be able to do this. Setting up a channel is a way of creating either an input to this system or an output from it. After setting up your channels you are then asked to modify an action. 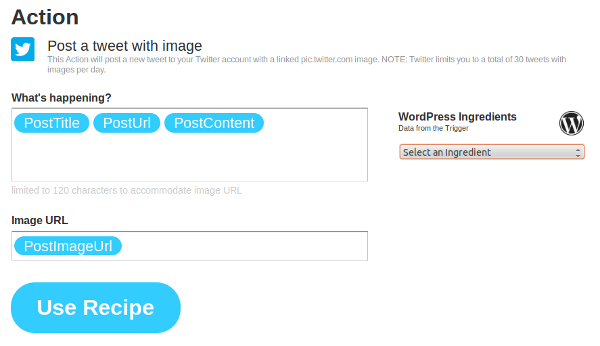 In this case, our action is to post a tweet consisting of an image taken from our WordPress site. If we want to change the contents of our post, we can do this by altering the Ingredients listed, or by adding text directly (as shown in the screenshot below). 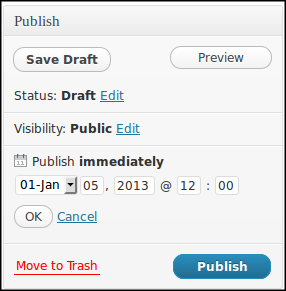 Once cross-posting was set up, the project members were able to schedule posts regularly using the 'date' feature of their WordPress site. Instead of publishing immediately, a date in the future can be set. This allowed them to write many posts at the same time and have them released over the following few weeks. This circumvented issues of access caused by low batteries and limited bandwidth. Behind the scenes, IFTTT uses a combination of APIs, RSS Feeds and OAuth. This enables access and easy movement of data between internet services. OAuth uses token-based user authentication rather than storing passwords. This is what happens when you activate channels and are asked to log into your internet services and then allow certain permissions. This is better than handing over your username and password. 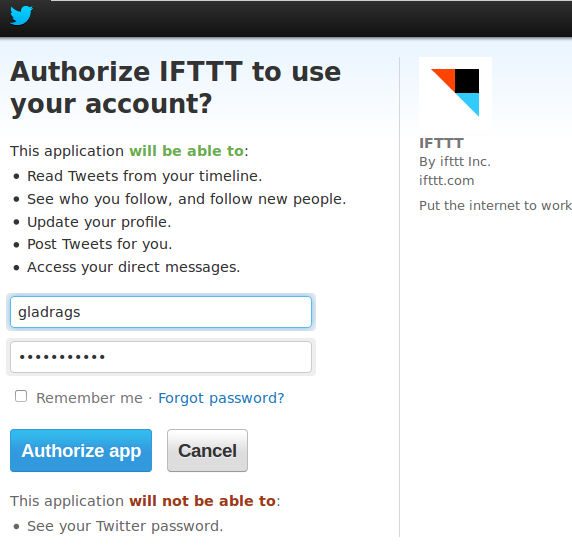 If IFTTT were hacked and your tokens taken, the intruders would only have limited access to your accounts. However, there are still some concerns, for example when you activate a Facebook channel. This screenshot shows that there are a few possible drawbacks to using IFTTT, too, because it asks for more permissions on your Facebook account than it really needs. This means that if the security of IFTTT were compromised, you could potentially be left quite open. http://dlvr.it - a similar internet service. brdcst.it - you can set up your own installation of brdcst.it by downloading the code and setting it up on your own server. This is a good way of bypassing concerns about security.